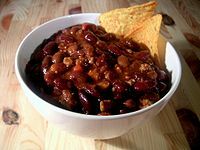 This recipe should not be confused as an attempt to replicate Wolf Brand Chili. Recipe makes 10 – 12 servings, and freezes well. Separate the thick strips of bacon and lay them in a large, COLD, heavy-bottomed pot or Dutch oven. For this proportion of meat, a pasta pot works well.Turn on heat to medium. Let cook very slowly until crisp. Remove with a fork or slotted spoon and drain on paper towels. Pour some of the drippings to grease a large large skillet. Leave a small amount in Dutch oven, and set the rest to the side for another use. Working in batches to avoid steaming the meat, brown meat and garlic in skillet. At the same time, saute onions in Dutch oven just until soft and translucent. When onions reach this stage, add the browned meat. Crumble the bacon, and add to meat with green chilies and dried peppers, spices, sauces, stock, and rotel tomatoes. Bring to a boil and, when boiling, lower heat to medium-low just to keep at a strong simmer. Cook chili, partially covered, for 2 hours. Add beans and simmer chili another 15 minutes.